Demonstrating a new perspective on antique style designs. 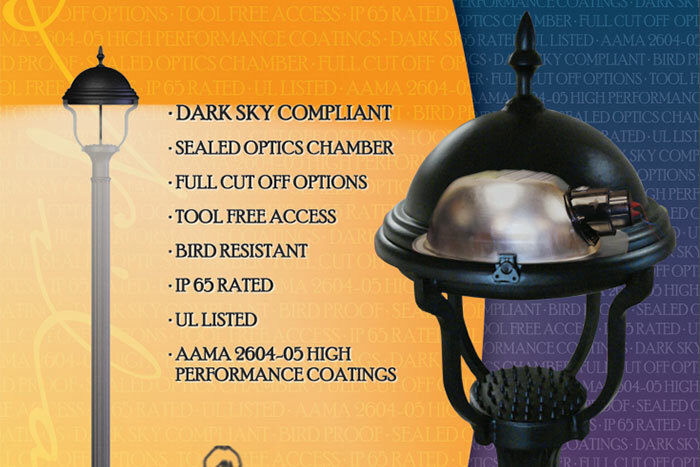 Manufactured to carry out high performance with twist and seal optics while honoring our master craftsman of the past. The outcome is a luminaire that delivers high performance photometric distribution with full cutoff efficiency. Construction from all cast materials, the Twilight Series maintains superb performance in the toughest surroundings. Twist ‘N’ Seal optical system seemingly eliminates luminaire contaminates from degrading output of the sealed optical chamber. Tool-Free Access to reflector for quick and easy relamping. Optical chamber offers unbeatable performance and full cut off with a combination of a hydro-formed aluminum reflector and tempered glass lens. Optional canopies available to customize any one of your projects.